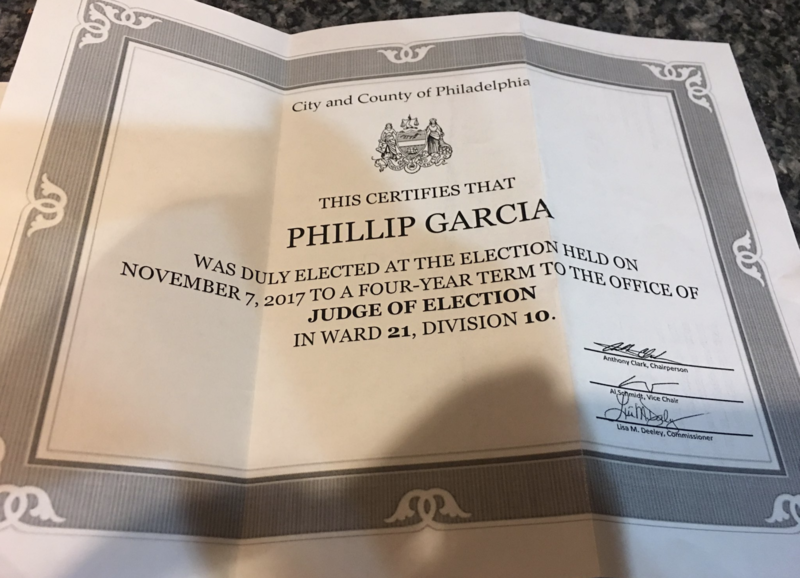 The old saying "every vote counts" has taken new meaning since Philadelphia resident Phillip Garcia learned he won a seat as a local election judge with just one single vote. Garcia, editor-at-large of The Rumpus, an online literary magazine, received a letter Friday from the city informing him that he had won the Nov. 7 election. The letter explained that he had been elected to the office of judge of election, serving on a board for Ward 21, Division 10, which covers a section of the Manayunk neighborhood. At first, Garcia was baffled, because he hadn't run for the office. Then he recalled writing his own name down on the ballot. Now he's using his personal experience to show others the power of one vote. "They say that one vote doesn't matter, but I literally wrote in my own name and won an election because I guess no-one else ran/voted for this position," Garcia tweeted, along with a picture of an official certificate. His Twitter profile now includes the title "Accidental Politician." The tweet went viral and hundreds of people replied to Garcia, some expressing shock, others offering congratulations. "This is easily the most...ridiculous thing to happen to me," Garcia joked. But Philadelphia Commissioner Al Schmidt says the news isn't actually that surprising. In fact, it can happen easily in local elections. "People frequently don't run for these positions and win an election like any other [position]," Schmidt told CBS News, confirming Garcia's victory. "It just takes one write-in and no one else filing paperwork as a candidate." Schmidt said a total of 71 election judge positions were filled by write-in candidates in this past election. And several positions remained vacant. "Philadelphia has 1,686 precincts statewide and each has an election judge," he explained. "They are elected every 4 years." Over the years, Schmidt says he has seen it all. "We've seen where people write in and not expect they're going to win — someone writes in a friend's name as a joke," Schmidt said. However, every winner has to formally accept the position, Schmidt says. If they wish to resign, they can do so by submitting a letter to the Office of the Philadelphia City Commissioners. While some may expect him to drop out, it appears Garcia plans to remain in his new position. "This actually will be a great way for me to be more involved in my neighborhood and work actively toward more progressive change," Garcia told The Hill. "I actually have a background in community organizing, and while I'm not entirely sure how this position could align with that, it seems like an opportunity to find some ways to at least more deeply connect with my neighbors." This particular gig isn't labor intensive. A judge of election only has to work on Election Day, receiving a sum of $100. They're in charge of running the election at a particular polling place, making sure lines don't get too long, reporting any broken voting machines and making sure paperwork is being filled out correctly, Schmidt explained. Judges are required to be a U.S. citizen, at least 18 years of age and a resident of the locality the position presides over. Schmidt says he isn't sure why Garcia is getting so much attention, but he's hopeful residents will learn from the Philly man's story. "Every vote certainly does matter — whether it's for president of the United States or election board judge of elections — but it matters all the more when you're the only person interested in the job," Schmidt said.